The EPIC Alternatives to Youth Incarceration project makes 14 grants totaling $500,000 to organizations in the Seattle area. The money was allocated by the Seattle City Council after a campaign by Ending the Prison Industrial Complex (EPIC) for zero youth detention. SJF facilitated a special giving project to grant the funds. Donald Trump wins the presidential election, sparking massive protests and resistance, including large Women’s Marches around the country the day before Trump’s inauguration. SJF resurrects its Rapid Response Granting (and also adds a Seed Grant program) in recognition of the political situation and the urgency of grantees fighting back against right-wing policies. The WA Immigrant Solidarity Network is created, comprised of several working groups, the Network is focused on developing community response teams and reporting tools to galvanize support and mobilize resources in response to ICE activity in the NW. Several SJF Grantees are a part of this coalition. The Standing Rock Sioux tribe takes a stand against the Dakota Access Pipeline and draws international support, including caravans of activists from the NW traveling to the encampment at the Standing Rock Indian Reservation in South Dakota. SJF does its first ever Momentum Giving Project and ultimately make grants to 8 organizations doing work around police accountability. The Momentum Giving Projects are designed to be responsive to the “movement moment” that is happening at the time. Subsequent Momentum Projects include Black-led organizing, Fight the Far Right, Housing Justice, and Native-led organizing. Michael Brown is murdered by police in Ferguson, MO sparking Black Lives Matter protests and uprisings around the country, including in the NW. #BlackLivesMatter is started by Alicia Garza, Patrisse Cullors, and Opal Tometi after George Zimmerman is aquitted of murdering Trayvon Martin. BLM chapters are formed around the country. SJF is inspired to do a Momentum Giving Project to support black-led organizing in 2015. The Idle No More protest movement erupts in Canada and spreads to the NW, with First Nations and Native American groups fighting back against resource extraction, oil pipelines, environmental destruction and the violation of indigenous sovereignty. SJF continues to support organizing on reservations and in Native communities, including grants to Indian People’s Action, Native Action and Native Youth Leadership Alliance. SJF launches its first Giving Project as a collaboration with the Seattle Resource Generation chapter. The Next Generation Giving Project brings together 18 people who raise over $135,000 and makes 12 grants to grassroots groups in the region. SJF launches a new Civic Action granting initiative in partnership with the Western States Center’s VOTE program. The initiative supported groups capable of translating electoral victories into substantial policy change that benefit people in historically marginalized communities. Grantees include the Rural Organizing Project in Oregon and the Equality State Poverty Center in Wyoming. The first US Social Forum takes place in Atlanta, Georgia. SJF grantees participate along with thousands of other organizations from around the country. The anthology “The Revolution Will Not Be Funded: Beyond the Non-Profit Industrial Complex” is published, a potent critique of traditional philanthropy and its relationship to non-profits. Hundreds of thousands take part in immigrant rights demonstrations throughout the country to protest draconian anti-immigrant laws proposed in Congress. In Washington, Oregon, Montana and Idado SJF grantees help organize large marches, including on April 10 and May Day. Grantees doing immigrant rights work include CAUSA and Latinos Unidos Siempre in OR and El Comite Pro-Amnistia General Y Justicia Social in WA. During its first 25 years of funding real democracy, ATR has grown to an organization of 400+ members that has contributed over $11 million to over 600 grantees. Continuing the effort to make the ATR community more democratic, ATR revised its membership definition in 2003 to attract individuals across boundaries of class. ATR membership now starts at $20 per month ($240 annually). Massive anti-war protests take place regionally, nationally and internationally in the lead up to the Iraq war. Grassroots groups in the NW participate in anti-war organizing, including ATR grantees like the Peace and Justice Action League of Spokane and the Jeannette Rankin Peace Center in Missoula. ATR members and staff participate in founding of Potlatch Fund, to provide grants and technical assistance throughout Northwest Indian Country. The September 11 terrorist attack leads to hate crimes against Muslims around the country and to the passing of the Patriot Act. In the Northwest, groups like Hate Free Zone (later OneAmerica) working to combat anti-Muslim violence receive grants from ATR. The first World Social Forum held in Porto Alegre, Brazil in 2001; the forum was focused on gathering anti-globalization activists from all over the world to talk and organize among one another. ATR introduces dismantling racism (DR) training for its leaders and members to identify and remove barriers to participation and to integrate DR practices and goals into its committee structure. Anti-WTO Mobilizations bring together organizations from throughout the region, country and world to protest unjust economic policies of the World Trade Organization. ATR grantees like the Northwest Labor and Employment Law Office (LELO), the WA Alliance for Immigrant & Refugee Justice and the Seattle Young People’s Project anchor the local coalition organizing against the WTO meetings. ATR changes membership definition to either contribution of $1,000 or more annually or 1% or more of annual income . $946,435 in grants is awarded to 161 organizations. ATR launches a revised multi-year Major Grant program that offers 3-Year Support Grants to encourage organizational stability and impact, and 3-Year Capacity Building Grants to develop stronger, more effectively managed organizations with greater impact and increased size. ATR initiates a Rapid Response Grant Fund to provide organizations with resources to respond quickly to legislative or policy attacks, or other unexpected events or issues. ATR and Western States Center co-sponsor Democracy Under Siege, a conference of 250 activists from 8 states. ATR celebrates its 15th Anniversary with an event at Daybreak StarCenter in Seattle. ATR funds various groups throughout the region supporting and empowering people affected by HIV/AIDS, including the People of Color Against AIDS Network, the Cascade AIDS Project and the North Idaho AIDS Coalition. ATR launches its Endowment for the 21st Century to permit a higher level of stability, increase ATR’s effectiveness and power as a foundation, build reserves for the future, and encourage donors to make substantial gifts to ATR. ATR grantees come together as part of a coalition in Oregon that successfully defeats Measure 9, an initiative that would have declared homosexuality “abnormal, wrong, unnatural, and perverse.” Overall, ATR increases funding to LGBTQ organizations in the 90s, including groups like the Lesbian Community Project in Oregon, United Gays and Lesbians of Wyoming, and PRIDE! in Montana. The People of Color Environmental Leadership Summit drafts and adopts the 17 principles of Environmental Justice. 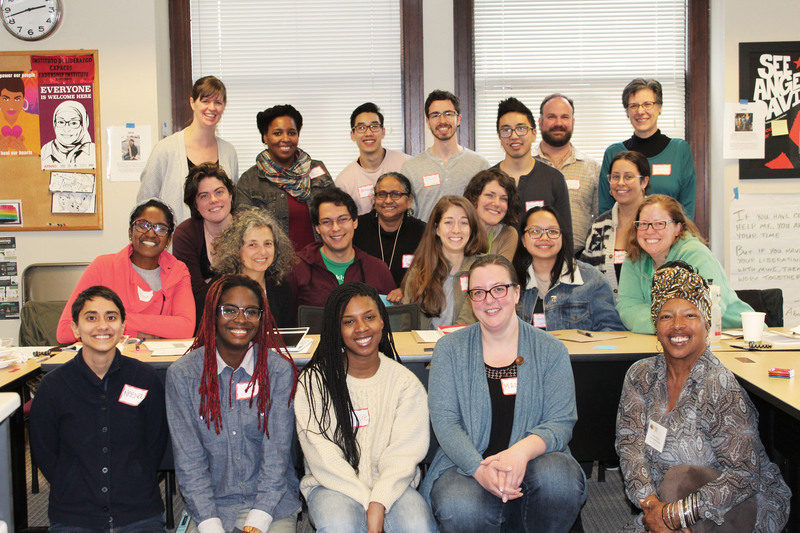 The principles become the centerpiece for many grassroots people-of-color led environmental groups, including ATR grantees founded in the 90s like the Community Coalition for Environmenal Justice (CCEJ) in Seattle and the Environmenal Justice Action group in Portland. ATR begins funding a number of grassroots community organizations throughout the region affiliated with the national Citizens Action network, including Washington Citizens Action (later Washington CAN), Montana People’s Action, Idaho Citizen’s Network (later ICAN) and Oregon Fair Share (later Oregon Action/ Unite Oregon). ATR Grantee Pineros y Campesinos Unidos del Noroeste (PCUN) helps organize the first farmworker strike in Oregon since 1971 when cucumber pickers at Kraemer Farms demand a raise in pay. The company retaliates against former strikers, and PCUN declares a boycott of NORPAC Foods, a co-owner of Kraemer Farms. The boycott lasts for nearly 10 years and helps raise awareness around the country of farmworker exploitation. As white supremacist groups gain ground in the Northwest, ATR begins funding anti-hate groups like the Northwest Coalition Against Malicious Harassment, the Coalition for Human Dignity, and Montana Human Rights Network (MHRN). $163,000 in grants is awarded to 50 organizations. ATR also initiates a Cultural Grant program to support community-based organizations using cultural work/art to promote social justice. ATR sponsors the start of the Nuclear Safety Campaign that assists in closing the Purex plant at the Hanford nuclear reservation. Western States Center, our sister organization is established to help strengthen and further develop the progressive movement in the West. In the face of continued public service cuts by the Reagan Administration ATR funds organizing and social service organizations addressing issues of increased poverty and homelessness, including groups like Montana Low Income Coalition, Idaho Fair Share, and the South End Seattle Community Organization (SESCO). The anti-nuclear movement grows strength in the Northwest and nationwide, culminating in a million person protest in New York. ATR funds various anti-nuclear groups in the region, including Puget Sound SANE and the Hanford Education Action League. ATR holds first summer meeting at Bridger Mountain in Montana. The threat of massive strip mining of coal in the interior West to feed the growing energy needs of the rapidly urbanizing coastal states was one of the most contentious issues of the time and a motivating factor in creating ATR. ATR is founded by six individuals wanting to maximize the impact of their giving to support progressive causes in the Northwest and Northern Rockies. Funds are distributed via two cycles of Basic Grants, in Spring and Fall, for general support or project-specific needs. During the first year of operation, ATR awards $14,000 in grants to 7 organizations.